Ethics for Steinbeck always entailed justice. This didn’t change over the course of his long career. Justice is constituted of a communal spirit, a relational situation in which individual humans care for their fellows, and a state that champions the cause of the needy and outcast. Any violation merits punishment if incurred by an individual or rebellion if incurred by the state. Upon such points as these most Steinbeck readers agree. 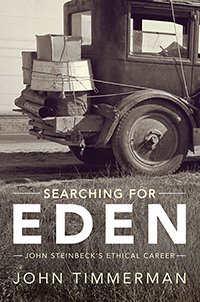 What hasn’t been done before, however, and what SEARCHING FOR EDEN undertakes, is a careful analysis of how these ideas fluctuated at different points during Steinbeck’s literary career. Of utmost importance here are the latter years of Steinbeck’s life when his deepening political involvement and immersion in Arthurian myth shaped a changing ethic altogether.